6:30pm to 10:00pm Wednesday nights. If you are a developer who wants to write applications that run on the iPhone or iPad, you should attend this class. In 10 evenings, Programming iOS will teach you to create iOS applications like the ones you use on your iPhone every day. The class focus is on solid iOS Programming fundamentals which will serve you well in any context. After an introduction to the Objective-C and Swift programming languages and the Foundation framework, we look in depth at the tools and the Classes that make up the iOS UI framework. We draw on the screen using UIKit, Core Graphics and Core Animation. We cover multi-touch event handling and the setup and configuration of a server in the cloud at AWS (Amazon Web Services) to support backend components of iOS applications. Your class assignments will interact with this server in a practical and real-world manner. This course can be taught onsite for your company. Dave has taught this class for Shopzilla.com, LiveNation/TicketMaster, and many other smaller companies and individuals. In this lecture we cover networking with sockets in the iOS environment, looking at a third-party library called CocoaAsyncSocket which helps wrap the sockets classes. The GameKit classes will also be covered. In class we demonstrated a custom URL scheme, which allows your app to be opened from links on web pages or from an email. Finally we cover testing with Over The Air (OTA) deployment on to test devices. In this lecture we wrap up our discussion of the GPS, then cover integrating multimedia into an application using MPMovePlayerController. See day8-video.zip for an example of playing an .mp4 video file from the app bundle. If you will stream video to the iPhone or iPad over cellular networks, you are required to send the video in HTTP Live Streaming (HLS) format. See the HTTP Live Streaming link as a starting point. In class we demonstrate delivering both .mp4 data and HLS data from Amazon Web Services. Handbrake is a great free application to encode video that is ready for an iOS app. Record a video of something G-Rated and interesting. Encode the video to .mp4 format using Handbrake. Encode your video into an HLS stream, and deliver it from an Internet server, such as an S3 bucket, a dropbox folder, Google drive, etc. In this lecture, we cover documentation using the JDoc standard. By following a few simple conventions, your documentation will become part of the help system in XCode, and you can automatically generate full documentation from your source code with tools like Doxygen, AppleDoc or HeaderDoc. Testing and monitoring your application performance can be a bit overwhelming. In class we introduce the "Instruments" tool to get you started in this area. We cover device hardware: Compass, Accelerometer, Gyro and the GPS with Core Motion, Core Location and including maps into your applications with MapKit. In this lecture, we continue our discussion of using Internet resources, and will look at methods of keeping the UI responsive during background processing. In a practical sense, this generally means downloading content from the Internet on a background thread. This frees up the main thread to update the UI and to handle input from the user. The 'Blocks' Objective-C language feature is discussed in class. This C-based API is becoming more important as a central technology to support background processing. Load four large/slow images from the Internet and place them onto the UIScrollView. Start with a simple blocking call to download the images, then refactor to incorporate Grand Cental Dispatch to keep the UI functional during the download. See the demos from tonight's lecture if you need some guidance with GCD. We will meet again next week. This is a good time to catch up/review homework. You might consider redoing a homework assignment using a different technique, such as with Swift or with Storyboards. Have a great week! In this lecture, we look at practical methods of interacting with data downloaded from Internet servers. In class tonight the open source network framework AFNnetworking was mentioned. Review this frameworks for an example of how to build networking code, as well as to practice including an externally written framework within your app. Open source frameworks are widely used and you may run into a need to support them. In this video homework 6 is demonstrated, downloading and parsing JSON data from a web server. In this video the setup of a new PHP/MYSQL webserver at AWS is demonstrated. Download the JSON feed we created in class at or a static data file that you create and post to a cloud provider such as AWS, Azure or Rackspace. In this lecture, we look at drawing within our own custom UIView classes. The drawRect method of UIView provides a context into which you can draw using the Core Graphics C library. The Core Graphics API is known as Quartz, Quartz 2D or QuartzCore. See the Quartz 2D Programming Guide at apple.com for in depth information about working with Core Graphics. Behind every UIView is at least one CALayer object exposed as the .layer property. CA (Core Animation) layers provide a rendering pipeline for the contents of a UIView that is handled by the onboard graphics chip, freeing up the CPU for other tasks. CALayer supports custom drawing using Core Graphics by calling a delegate method drawLayer:inContext:. CALayer also calculates intermediate positions of UIView objects when you change a property within an animation block. Core Animation Programming Guide at apple.com is a great reference for Core Animation in general and in getting started with CALayer objects. CALayer objects are quite similar to UIView objects (frame, subViews/subLayers). The main difference is that a CALayer object will not handle touch events, and they tend to have a lighter footprint and be faster to render. Don't forget to import <QuartzCore/QuartzCore.h> as you start to work with CALayer objects. In this lab, you will investigate drawing custom UIView objects with Core Graphics and CALayer. Many of the more creative iphone and ipad application interfaces use this technique to create something truly unique and dynamic. In this lecture, we look at view controllers and classes that act as parents to UIViewControllers. UINavigationController is a class that maintains a stack of view controllers, and presents the user with the option to move deeper into a hierarchy of data, then move back up the hierarchy by using a back button. Generally as you navigate up and down the stack, the .view property of the UIViewController slides in from the right, and slides off the right hand side of the screen as you navigate back. UITabBarController is best used when you have distinct sections in your application. Each tab may have a different look at the same data, or it might be completely distinct, such as a "Settings" page. The "Music" app and the "App Store" app are good examples of applications that make extensive use of both tabs and a navigation stack. Please spend some time in these apps, paying attention to layout and behavior of the UI elements. In this lab, you will investigate UITabBarController, which contains an array of UIViewControllers. The UITabBarController manages the display of the .view property of each UIViewController held on each tab. Create an iphone or ipad application using the view-based template. In didFinishLaunching, it is important to setup the UIWindow properly. See the demos from day4 for examples. In didFinishLaunching, Implement 3 Custom UIViewControllers and add them to a UITabBarController. Place the UITabBarController.view onto the screen as the rootViewController property of self.window. In the first tab, implement a UINavigationContoller that holds a UITableView showing your favorite musicians. Slide in a detail screen with more information about the musician when a row is clicked. On the second tab, display a scrollable UIImageView with a world map that is larger than the physical screen on the device. You will need the UIScrollViewDelegate for this to function correctly. On the third tab, display a UIWebView implemented as the .view property of a custom UIViewController. Display your favorite g-rated website in the view. As a tip to help you complete the lab, consider implementing each view controller in a small application independently. After each small application is complete and working properly, then add them to the homework assignment. In this lecture, the Foundation classes NSArray and NSDictionary are covered in more detail. The design pattern of delegation that allows objects to communicate with each other is discussed. The delegate design pattern is demonstrated through implementation of a basic UITableView object and through implementing a .delegate property on a custom class. The purpose of this homework assignment is to gain more practice working with delegation and the UITableView class. Hopefully you will have fun with the assignment and will experiment outside of the homework requirements, for example by adding a custom view to the UITableviewCell or by changing the appearance of the cell. This one could take up some time as some of the concepts may be unfamiliar. After you get the tableview to work properly, add the appropriate delegate method to change the height of each UITableViewCell to be 100 points. This assignment will take some time, but will be a foundation for many iphone projects. 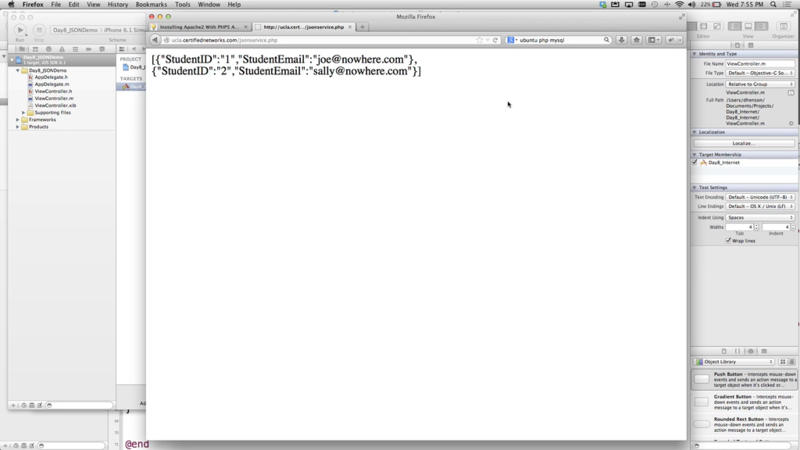 It appears your browswer does not support html5 video. You could try another browser, or click homework3-uitableview to download the video. In this lecture, we review the startup process of an iOS application from main() to the UIApplicationDelegate's application: didFinishLaunchingWithOptions: method. 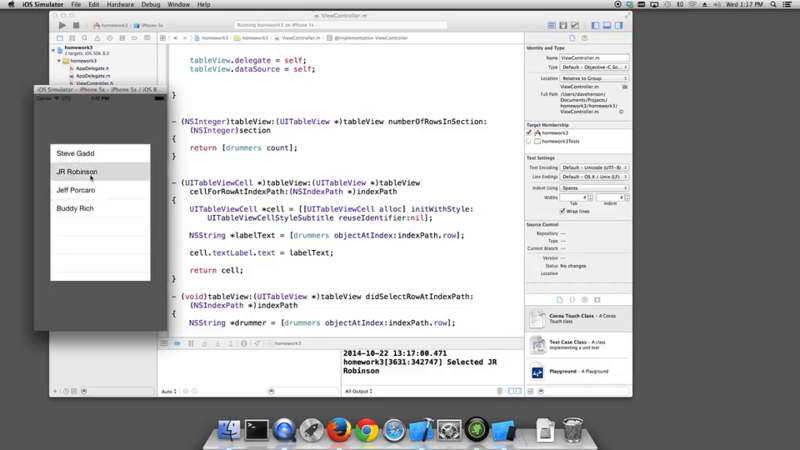 We continue to investigate Objective-C and Swift classes including methods and properties. The UIView hierarchy is reviewed, and more of the properties of UIView are discussed. A few specialized UIView objects are demonstrated, such as UIImageView and UIWebView. The target/action pattern is introduced and an example of this pattern is demonstrated with a UIButton. This wikipedia link on Target/Action might be interesting to check out. The 'target' of the UIButton will typically be the UIViewController, and the 'action' will be a method that has been defined by the programmer in the UIViewController. It appears your browswer does not support html5 video. You could try another browser, or click homework2-target-action.mp4 to download the video. In this lecture, practical iOS development is introduced. A sample application named 'learning-ios-first-app' is created to introduce the Objective-C language and its basic elements. Objective-C is an programming language that features extensions of the ANSI C language. These extensions that have been added are mostly centered around object-oriented programming: creating Classes and working with methods on the Classes. 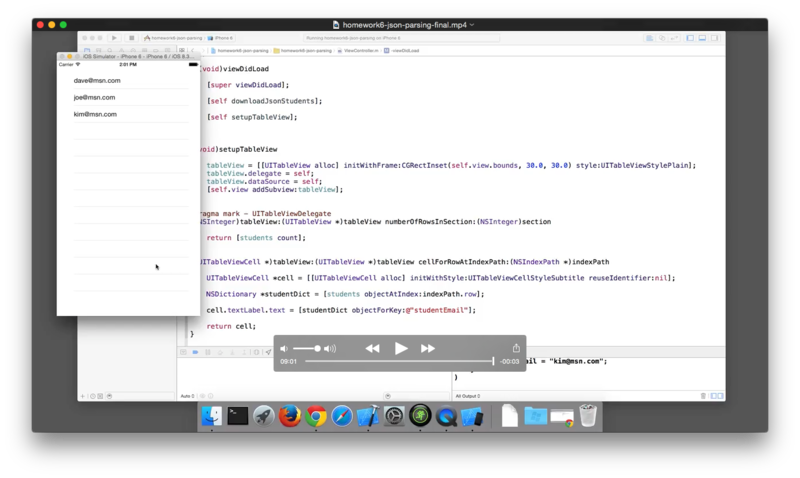 Swift is a programming language release with iOS8. It is a more modern language and is similar to Java and C#. Devices must be running at least iOS7 to support a swift application. 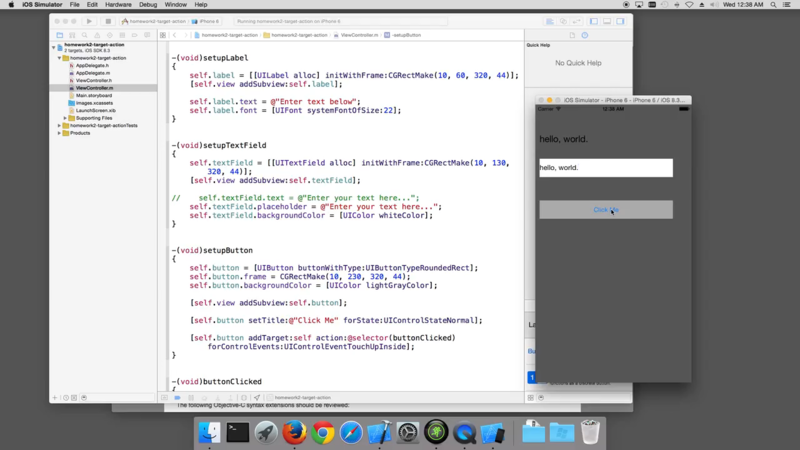 The Apple Swift website is a good place to start learning about Swift programming for iOS, as well as the Apple WWDC Site. Send an email to Dave at dhenson@certifiednetworks.com with iOS in the subject line. This is important so your email address can be whitelisted. Install the current production version of XCode - Version 7.0 released 9/2015. This will likely need to be updated before our class is over. 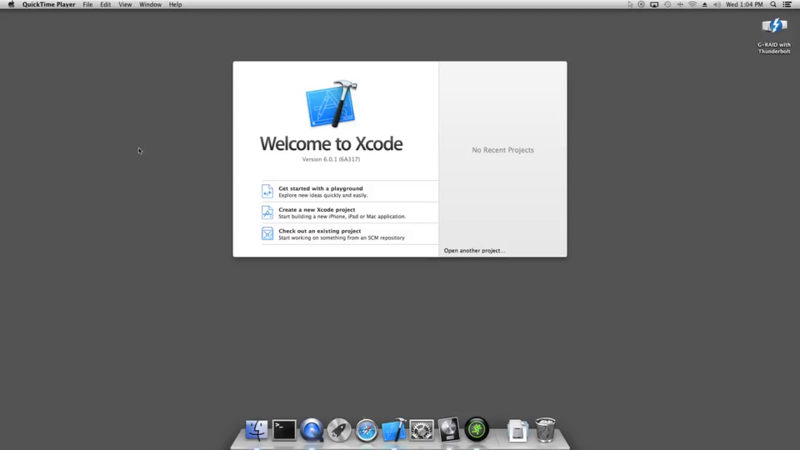 Use the "App Store" application on your Mac to find and download the free (quite large) XCode application. Create an iphone application using the "Single View Application" template. Display a red UIView object on the screen. Zip up the project folders and email them to Dave. See the video(s) below for help! It appears your browswer does not support html5 video. You could try another browser, or click homework1-201310 to download the video. Budget Boss - Student Damian Toohey wrote this app on the appstore. Congrats Damian!